← Finally, the 2012 inaugural tomato eating ceremony! 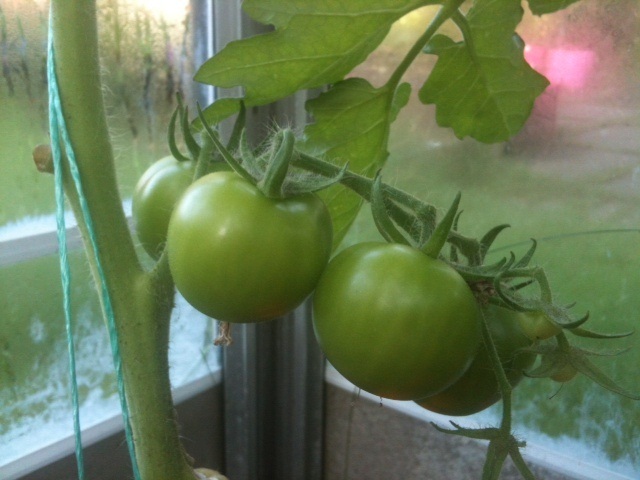 With the amount of rain and lack of sunshine this summer it looks like many greenhouse owners will have a glut of green tomatoes. Fear not, this tasty recipe transforms them into a delicious chutney that will see you through to next summer. Wash the tomatoes and cut them into quarters; peel the onions and quarter them; quarter and core the apples, leaving the peels on and keep them in water to prevent browning. Using the medium blade of the mincer, mince the tomatoes and place them in the pan; next mince the onions, then the raisins followed by the apples, adding them all to the pan. Now add the garlic, the cayenne, salt, ginger and sugar, blending everything thoroughly. Next, if using the pickling spice, tie it in a small piece of double-thickness gauze and attach it to the handle of the pan so that it hangs down into the other ingredients. Now pour in the vinegar, bring to a simmering point, remove any scum from the surface, then let it simmer very gently for about 3 ½ hours without covering. Stir now and then, especially towards the end, to prevent sticking. It is ready when the vinegar has been almost absorbed, the chutney has thickened to a nice soft consistency and the spoon leaves a trail. Pour the hot chutney into hot jars, filling them as full as possible and seal with a tight lid. Label the jars once the chutney is cold. Store for at least three months in a cool dark place before using. This allows it to mature and mellow in flavour. It will be worth the wait! 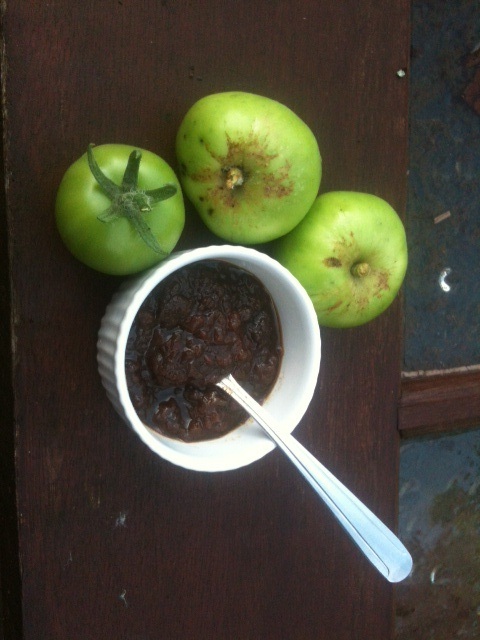 This entry was posted in Recipes and tagged green tomato chutney. Bookmark the permalink. Green tomatoe chutney is wonderful. Our problem here is not lack of sun back lack of rain. Hard to get the tomatoes to a mature size before they trun red and ripen. Baby tomatoes any one?? It has been a topsy-turvy summer all over I think. With all of your tomatoes try my favourite summer meal. Cut the tomatoes in half and put them in a roasting tray. Cover with salt and drizzle with olive oil and a little balsamic vinegar. Put them in a medium oven until they start to thicken up into a lovely sauce. Boil and drain some pasta and mix in the tomatoes. I usually eat this so often through the summer that by Autumn my skin is starting to turn orange!